Tacky Glue has an extra-thick formula that won’t run and grabs hard-to-hold items on contac, like beads, stones, and jewelry. It dries clear and flexible, and is nontoxic. This all-purpose industrial-strength craft adhesive delivers a high-performance bond. Its gel-like consistency is ideal for a wide variety of materials: wood, plastic, fiberglass, metal, ceramics, rubber, glass, leather, and hard plastic. Devcon 2-Ton Epoxy is an extremely strong two-part resin blend which forms a powerful bond with ferrous and non-ferrous metals, ceramics, wood, concrete, or glass in any combination. Easy–flow syringe makes mixing easy and snap-open cap reseals for storage. it dries clear and waterproof, and fills gaps without shrinkage. Devcon sets in 30 minutes, and the object can be handled in 2 hours. Fully curing the bond takes 12 to 16 hours. E-6000 is a tough, flexible and highly versatile rubber based compound with exceptional adhesive, contact adhesive and sealant qualities. It’s washer and dryer safe, and suitable for use on a wide variety of materials. E-6000 achieves a "tack hold" in 5 to 10 minutes. Full curing usually takes 24 hours, and you can paint over it in 24 hours. Curing may take longer if it's applied thicker. 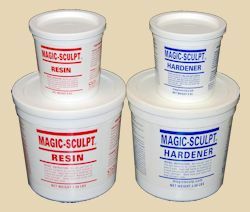 A two-part resin putty perfect for making large repairs (when pieces may be missing) or filling large cracks. To use Magic-Sculpt, pinch off or measure equal amounts of the two ingredients and knead them together. When they are fully blended, use the putty for whatever purpose you need. If you're fixing cracks or attaching pieces or parts, we recommend allowing 24 hours for a full cure. You should be able to feel the putty beginning to cure and mature within roughly an hour. If the putty doesn't cure, that means the amount of one component was smaller than the other. 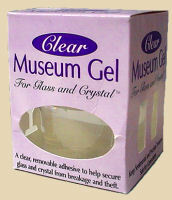 Museum Gel is a transparent adhesive that holds glassware, crystal, vases, statues, and other items secure against cleaning, feisty pets, playful kids, and earthquakes. It's designed primarily for glass-on-glass applications, although it can be used on most surfaces. It's easy to use: scoop a little out of the jar and roll it into balls. Place on the bottom of an object, press down lightly and twist into position. The gel gradually flows across the base of the item until it creates a superior invisible bond. The gel is designed for use on flat, level surfaces only and takes up to an hour to set properly. Removeable, reusable and nontoxic. Pull off the amount you need and roll it in your fingers until soft. Apply putty to the base of the object, then lightly press object to surface. Remove the object from the surface by twisting and lifting from base. 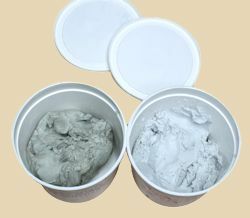 Museum Putty comes off clean, and works on most surfaces and walls. It's removable, reusable, nontoxic, and won't damage furniture. • Ceramic Spray Sealers are final spray coatings that produce smooth, hard surfaces and are used to brighten colors and protect the finishes of objects decorated with nonfired color products. • Super Gloss produces a gleaming, smooth and extremely protective final finish. This sealer provides the glossiest possible spray finish over both water-based and oil-based nonfired colors. • Clear Gloss and Clear Matte can be used under, over and between coatings of Duncan nonfired colors. To maintain a bright acrylic basecoat, spray on a coat before antiquing. • Porcelain Spray produces the look and feel of fine porcelain bisque when applied over a fired glaze or Prep-Coat. It works especially well as a final finish over dry-brushed items and can be used under, over and between nonfired colors. • Super Matte produces a smooth, even, flat-matte finish on nonfired acrylic and translucent colors, and works particularly well on realistic-looking animal figurines. It slightly softens underlying colors and provides a shine-free protective surface.